Surgical intervention in any disease is considered to be a huge stress to the body. However, now, along with abdominal operations, became possible and less traumatic intervention, called laparoscopy. However, this type of operation, despite all the advantages, it is not always welcomed by doctors. To select an intervention, you need to understand the specifics of each method. And laparoscopy, and laparotomy are the techniques of surgical operations on the internal organs. Rather is not different operations and two different types of access to the abdominal cavity. Laparotomy involves opening the abdomen through the incision. This operation is considered to be abdominal. The intervention always takes place under General anesthesia and is considered to be quite traumatic. 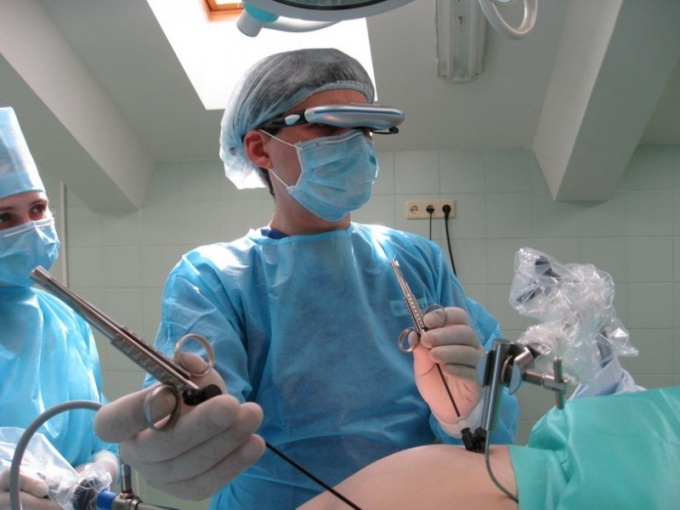 Therefore, most surgeons prefer a minimally invasive method of surgery — laparoscopy. Laparoscopy — this surgical operation in which surgery is performed through small incisions in the abdomen (usually three or four, depending on that you need to access). The cuts are inserted in a special tube, through which the surgeon operates. The operation is performed under video control, input into the abdominal cavity through one of the incisions. As with laparotomy, laparoscopy is performed under General anesthesia. 1. Low-impact operation. When laparoscopy is not possible to cut the abdomen, hands and the surgeon's tool is not in contact with internal organs of the patient using the video camera it is possible to increase the image of the bodies, considered with the smallest damage in the structure of the body. All this is a huge advantages of the laparoscopic method. 2. Neat seam. After laparoscopy shevchiki applied to the incisions, minimal and almost not visible to the eye, whereas after laparotomy remains a large and unsightly scar. 3. A small recovery period after surgery and a brief stay in the hospital. Observation in hospital after laparotomy the patient will need at least two to three weeks, and even months. The pain of the postoperative period eliminates any physical activity, and the stitches hurt. During a laparoscopy, the total time spent in hospital is calculated in three-five days, and recovery after surgery takes place within weeks. 4. Small risk of adhesive processes after abdominal operations the risk of adhesions is extremely high. The advantages of laparoscopy, of course, obvious. However, it is not always the surgeon can conduct the intervention with laparoscopy. In some cases minimally invasive surgery is impractical. For example, the presence of a large tumor in the pelvic organs or an existing adhesive process of the abdominal cavity made it impossible for a laparoscopy, and in this case, the surgeon is forced to resort to laparotomy. In addition, emergency patients, it is often easier and faster to carry out a laparotomy than laparoscopy jewelry. Of course, the best source of advice in choosing the method of operation will be watching the patient's surgeon. However, in matters of their own health the patient should not rely "at random", and it is better to know in advance what to expect from a particular intervention.